You will earn 1,951 Reward Points. Earn 1 reward point for every 1 dollar spent. Covers Available: Catalog numbers on reverse side. Pitched Aluminum Dust Cover: Shields lower truck contents against dust or dirt. Heavy-Duty Heavy-duty models contain heavier gauge corner posts and two additional intermediate frames. 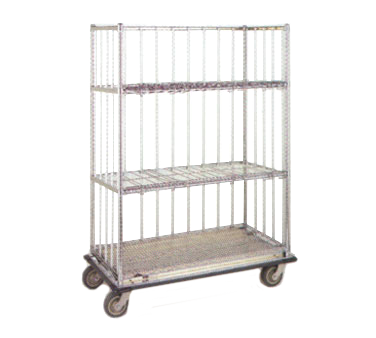 Open Wire Features: Minimize dust accumulation and allow a free circulation of air, greater visibility of stored items and greater light penetration. Brake Lock/Swivel Lock Combination Casters: Enable a single pair of casters to serve as swivel, rigid or brake casters to meet varying operational needs. Folding shelves can be positioned vertically to become an enclosure panel, creating a spacious rolling bin for the collection and the transportation of soiled linen. While folding shelves are in a vertical position, the lower folding shelf can be flipped out and up, enabling contents to be unloaded with a minimum amount of handling.